I must confess Easter Island was never on my travel plans. Not because it didn’t seem like an interesting destination on my mind (quite the opposite!) but because, somehow, it always felt like “too far, too hard to reach”. 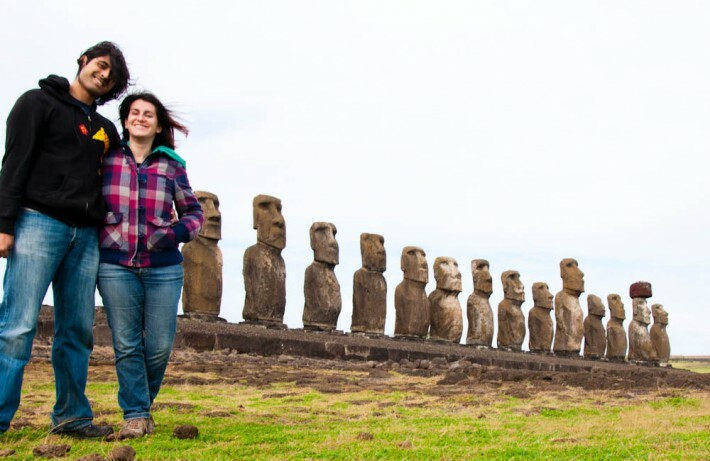 Before visiting Chile, I actually didn’t even know Easter Island is officially a Chilean territory. Although considered one of the most remote inhabited islands on Earth, it can be reached relatively easy by a 5 hour flight: there are daily departures from Santiago de Chile and occasional ones form Lima (Peru) and Tahiti (French Polynesia). While visiting Chile, being closer than ever, we couldn’t pass on the opportunity and visit this tiny piece of land, which mysteries and magic couldn’t be any less proportional to its size! 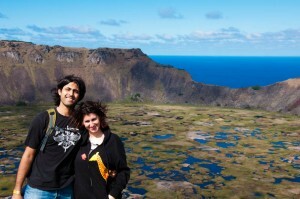 The first thing we learn in Easter Island is that the actual name of the place is RAPA NUI. Before Easter Island became a Chilean territory, Polynesian was the official language of the island and Rapa Nui its name in this language. It is understood that the first inhabitants of Rapa Nui were Polynesian men and women who left what is currently French Polynesia and took off to discover new horizons using simple canoes as transportation. Tahiti in the French Polynesia is more than 5 hour flight away from Easter Island, so one can only imagine the odyssey that it must have been to arrive there on wooden canoes floating for more than 4000Km, not knowing exactly where they were going! 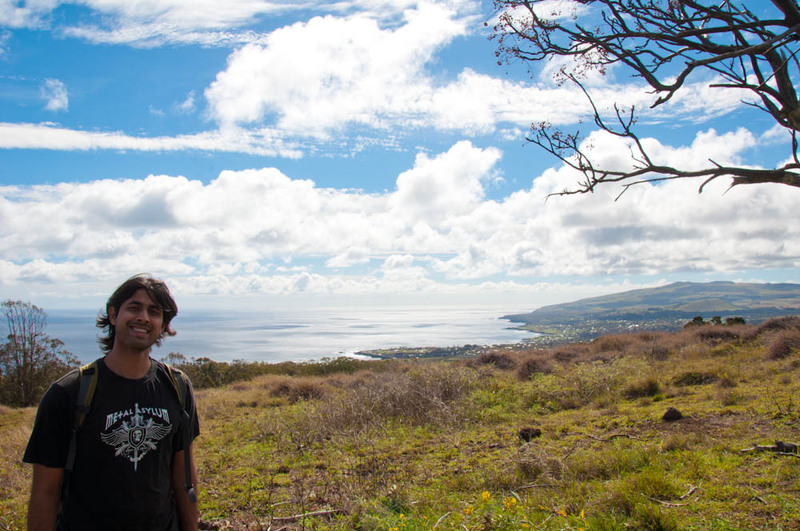 Climbing Rano Kao volcano, with a great view out to the Pacific! 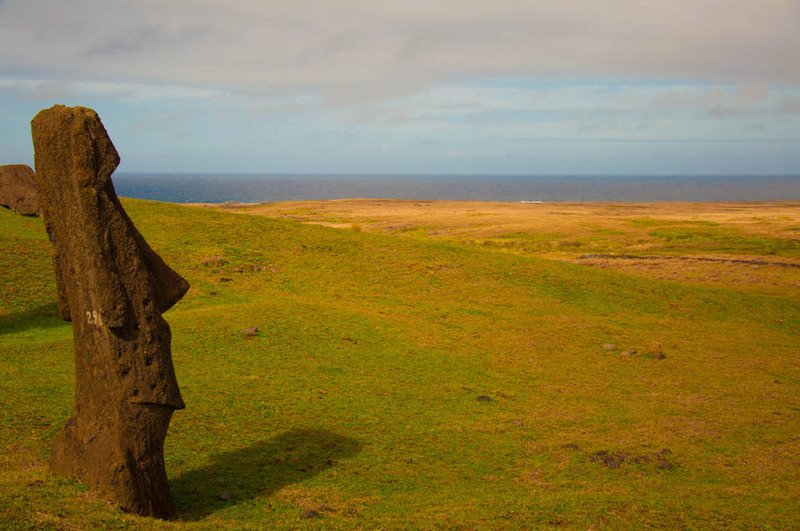 The name Easter Island was only given to this land in 1722 when a Dutch explorer arrived to the island, on what was coincidentally Easter Sunday. 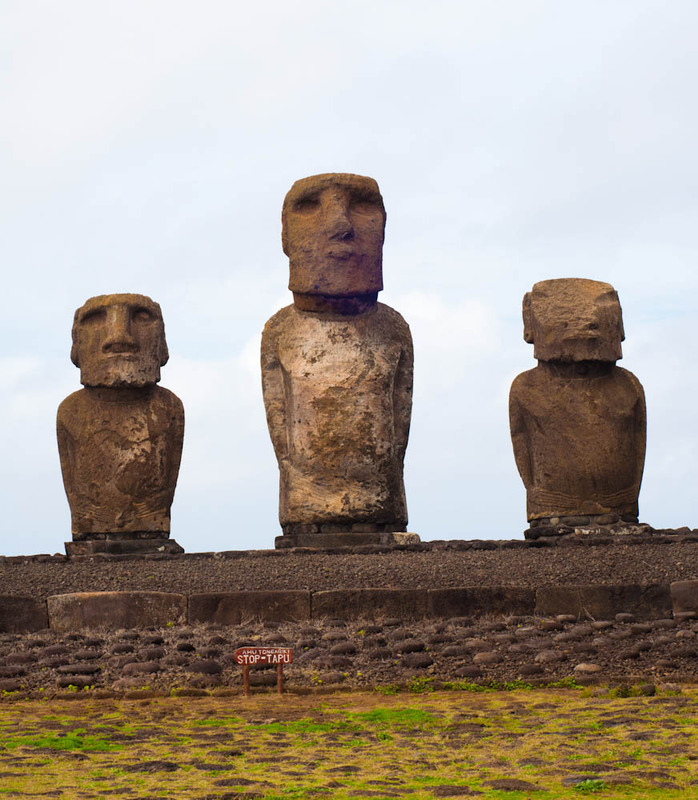 In a way, this switch of names influenced by the Western religion, could have been a premonition of what was to come later on: in 1888 Easter Island became an annexed territory to Chile, despite the disapproval of the majority of the local population. 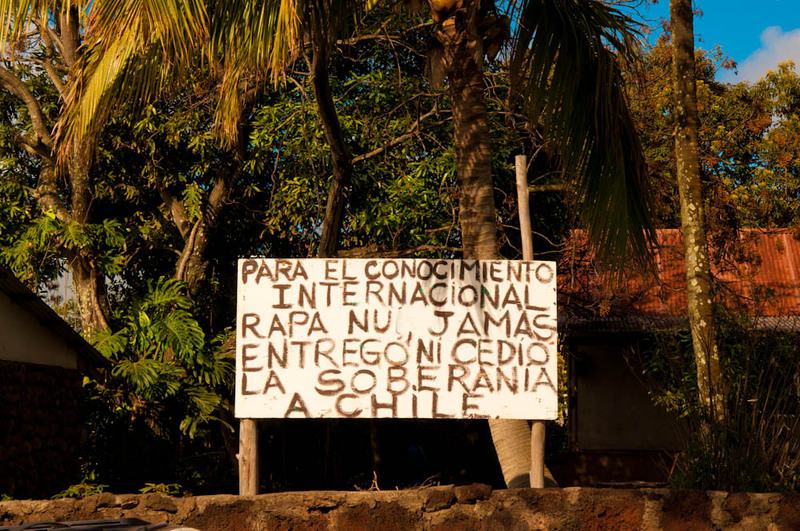 When this happened, the Chilean government rented the island to an European company who exploited the lands as a sheep farm confining the Rapa Nui population to the limited areas of Hanga Roa (currently, still the only town/city in the island). Not only the Rapa Nui were robbed of their land, they also had to learn how to leave in captivity, while sheep (!) would eat the grass around their homes. "For international knowledge, Rapa Nui never gave its sovereignty to Chile"
Fortunately after the 60s this oppressive panorama changed and the island started opening up to the exterior. Since then, tourists, historians and scientists have been exploring the mysteries around the huge stone statues that we all know Easter Island for: the Moais. It doesn’t take much effort to look for an archeological site in Easter Island. In fact, there are Moai statues galore, confined in specific areas as well as “sitting” in the center of town. Some might think that, due to the grandiosity of these stone carvings, they are depicting gods. 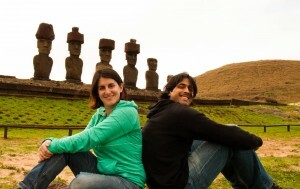 The truth is that the Moais are funerary monuments, erected in the honor of the Rapa Nui people who died centuries ago. Before a family member would pass away, these huge monuments would start being carved and only made vertical once the person was finally gone to another world. The Moais were placed in ahus (somehow equivalent to an altar), facing the inland and with their back towards the sea. Once in vertical position, the eyes of the Moai would be placed in the holes previously carved. The greatest mystery surrounding the Moais and, quite probably the entire island is: how could a civilization with no modern tools transport these monuments that weigh up to 80 tons? It’s relevant to mention that the Moais were carved in the center of the island, directly out of a mountain’s stone, and this means carrying them for several kilometers, depending where in the island they would finally place them. This might be one of those rare cases when tradition and science are both right, even if tradition is just using a metaphor! Click here for more stories about devastation, beauty and hope: History and Fun in Easter Island, part 2/2! These are beautiful photos and a great description of a unique place!! Especially loved the ‘easter statue walking’! Thanks Belle! :) The Moais and stories around them are quite fascinating! such a cool post! i don’t know why, but it left me in a great mood. 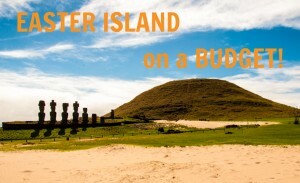 My sister in law is thinking about travelling to Easter Island so I have sent her a link to your blog.